Top two discoveries for building so far. ZL or ZR lets you 'copy' an element by selecting it and letting it go (rather than moving it). L or R... MULTI-GRAB MODE! That's right, you can select entire sections of screen by click and dragging the yellow marque tool around onscreen elements. I sooooooo wish I had discovered this sooner! Skimmer! I didn't know about using both to erase. That's a great tip! The best comes next! I'm telling you! My next unlock is the Super Mario World theme and the ghost house elements. I can't wait! Anyone tried building an underwater level yet? I tried, and it's considerably more difficult than I thought it would be. I may wait until I can have sub-levels and start by building levels with underwater elements rather than a full-blown underwater level. My world 2-1 is an underwater level (all my levels are SMB1 so far; I'll try my hand at some SMB3 stage crafting in the near future), and yeah; it takes a totally different mindset to make a water world than a regular stage. I'm moderately happy with how my first one turned out, but I'll go back to it and polish it up more as time goes on. I cannot emphasize enough just how thrilled I am with Super Mario Maker. I have 30 years of internal hype built up for this game, so I hope that explains just how significant an achievement this game is when I say that I am indescribably happy with what we got. Yes, I know there are lots of elements from the source games that didn't make it into the creation engine for this, but we got more than enough tools to accomplish what I want. This game is a lifetime of gaming in the making for me, and the fact that Nintendo delivered on my hopes is almost unbelievable to me. To say that it is a lock for my game of the year is pretty much stating the painfully obvious. It may be my game of the decade. It may be even more than that. I don't know. All I do know is that I am giddy over Super Mario Maker, and every minute not spent playing with it is spent waiting until I can play with it again. I'll go back now through the posts since I last updated the OP and get the OP updated again. Final revisions done. Farscry, I won't be changing/deleting this level so if you want to use it as my anchor code feel free. I like the "anchor level" idea; I've tagged this one for Ahrez and my 1-1 level as anchor levels, meaning that these will be left uploaded as they are to make it easy to find and follow us. Anyone who wants to can pick a level of theirs to be their Anchor Level; just post it and I'll tag it as such in the OP. And I strongly, strongly encourage everyone to follow each of the goodjers who are posting levels, it makes it so much easier to just go to their Maker profile and play their stages rather than having to punch in a bunch of characters each time. I think I've followed everyone who's posted a level in this thread; if you don't see me on your "followers" list in-game, please PM me and let me know so I can make sure to follow you! I don't want to miss out on anyone. I'm also going to try to go through and star everyone's levels, it looks like it takes a lot of stars to build up your limit of uploaded levels, so we can all use every star we can get. This is the first console video game my son has ever wanted to play. He's having a blast just putting bowser juniors under thwomps and giggling maniacally as they scream and die. I've made a handful of short levels, but haven't felt the need to upload them yet. ...when it was well past time for me to be asleep. I actually kind of dig the results. It's at least good enough that I can start contributing to the thread and give people a chance to follow me. Yeah. I beat the Mario challenge wearing a Bowser costume and Toad said "Bowser?! I thought you brought our princess to another castle!" I love how self aware this game is. I look forward to trying that out, Vargen! I cannot emphasize enough just how thrilled I am with Super Mario Maker. [...] This game is a lifetime of gaming in the making for me, and the fact that Nintendo delivered on my hopes is almost unbelievable to me. To say that it is a lock for my game of the year is pretty much stating the painfully obvious. It may be my game of the decade. It may be even more than that. I don't know. I was really undecided about getting Super Mario Maker for myself when Demosthenes surprised me with a copy. I am so glad I ended up playing it. It's a really incredible experience. I didn't think I'd have a rival for my Game of the Year pick (Splatoon), but Mario Maker is making a really strong case for itself. I want feedback on my third level! I thought that it turned out pretty fun, but I may be too close to it. If you play it, "take some notes" and let me know if there's anything weird about it or if something is too difficult or easy. Not many people have played it yet. Not sure what my fourth level is going to be like. I'm thinking of doing a corridor-ey type thing where you can go really fast. I'll give it a spin tonight. I've been really bad about going into Play Mode at all. A couple times this weekend I tried to make a point of playing all the stages you folks have posted, but I know I fell behind. I'll make an extra point of taking notes on yours, Tuffalo! And I'll admit, some of you are making tricky/gimmick stages that are a little too wild for me. I need to go back and retry some of Pyxi's wild concoctions (I don't think I've managed to beat a single one of her stages yet!) and damnablebear's most recent mousetrap. Many novice Mario players (especially younger kids) never figure out how to use the run button in conjunction with movement or jumping so, if you're concerned about playability for children, that should be an ongoing testcase. 8-1 does a good job of testing aggressive play in general; as there are multiple segments early on where it baits you into kicking a turtle shell and chasing a kill combo (and what advanced players might see as a 1UP opportunity), only to throw a pipe in there to bounce that turtle shell right back at you and kill you if you don't react quick enough. The final staircase exemplifies this approach: by putting gaps in between the steps, the player has to emphasize precision over speed, as the inertia from running will carry them right into a pit. Simple spatial adjustments can go a long way in tilting and tweaking a level's difficulty in subtle ways. If you're trying to accommodate multiple player types with the level you've created, that would be the first aspect I would recommend checking out. Good post, OzymandiasAV! I didn't even think about testing while not running. I'm gonna have to do that from now on. This has been one of my FAVOURITE unlocks. I just thought it was a very nice (and well-timed) setup that you, as the player, get to switch back and forth from navigating the top row in the level, with the bottom, until the shell passes through the flag at the end! Sort of in the same vein as those "Don't Touch Anything" levels, but this one actually has a few things for you to do along the way. I told you all it was the best! Sound effects and whatnot are cool, but the ghosts and INVISIBLE blocks are the best imho. More the invisible stuff than anything. Now I can finally make surprises and secrets! Please try mine too! It was originally gimmicky but I tried to make it significantly less so. In fact I was going for something like what Ozymandias talks about, a level similar to what you might find in World 8. A level you can clear at any level of experience but which requires you to slow down a bit. There's also a secret for those who want to explore. Speaking of which, I wish there was a way to disable the entire level preview. It makes it impossible to hide separate paths in a level since the player gets to see the whole thing (albeit from far away) before playing. I'm thinking paths like the warp pipes in 1-2, or the alternate high routes in Airship levels. These types of things work when the player can't see the whole level, but they fall apart rapidly when you get an aerial snapshot like Course World gives you. I'm not sure if I'll try underwater or airship next. Both have very interesting challenges for design. I like your idea of starting with a sub-level to get a feel for it, because especially for underwater trying to go for a whole level the first time seems daunting. I actually went and played some Super Mario World this weekend which was fun. I got past castle 3-1 which was extremely difficult for me. So many deaths. Really excited to get the Super Mario World stuff. That'll probably be all I will use ultimately to create. I don't really like the wall jumping element of the new stuff or the physics. Wizards/magikoopas are jerks. I kinda wish they weren't in SMM. Yeah, it would be nice to be able to somehow spoiler the preview. That said, I never look at it too closely, so I'd say you can probably design hidden stuff and have a good chance people won't know. Also, if it comes up in a playlist, the player won't see the preview (I think?). It will not show in a playlist, which is nice. Still it would be a good feature to add the ability to disable it. But how else will I know before I load up the level that someone's written a bunch of slurs across the level in coins? Heh, I've been testing every level like that from the get-go! But that's because I have intentionally been making them new-player friendly (and gradually will introduce some jumps that require running). However, I haven't been diligent about testing my levels at full-tilt speed. I should do that! I've definitely played a few levels where the preview consisted entirely of a start section, a downward pipe, an impassible wall, an upward pipe, and a level goal, with the vast majority of the level hidden away underground. I don't have the ability to do that yet, so I'm not entirely sure how it' stone. I'm in process of redownloading all my 2D Mario games on my 3DS and Wii U, with a focus on replaying at least Super Mario Bros. 1 and 3, Super Mario World, and NSMB U (and maybe 2). Anyone else find a renewed interest in these games? I definitely did, but with a focus on the ones I haven't played yet or at least much. 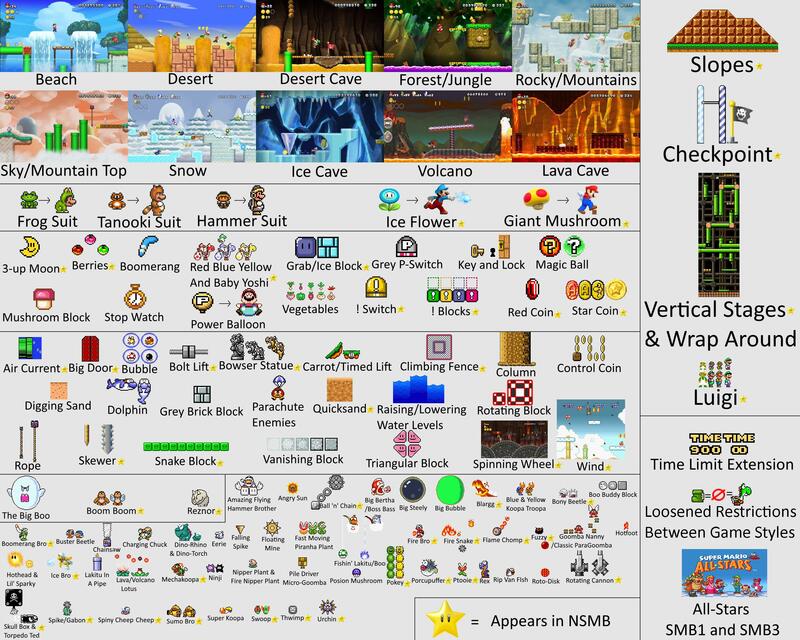 So NSMB U and NSMB 2 most likely. Just brilliant moves all around, Nintendo. Maybe now I have an excuse to actually play New Super Luigi U.... maybe. Mario Maker is too fun though!